Israeli authorities have decided to close schools run by the UN Relief and Works Agency for Palestine refugees (UNRWA), as soon as early 2020. Israeli Channel 12 reported, earlier, according to the PNN, that Israeli Prime Minister Benjamin Netanyahu discussed the decision with members of the Israeli National Security Council, during a meeting last week. The TV channel reported that no permissions will be issued for UNRWA schools to act in East Jerusalem from early next year, saying they will be replaced by schools run by the Israeli municipality of the city. The United States, the largest single contributor to UNRWA, announced last August that it would end its $350 million a year funding for the agency, describing the organization as an “irredeemably flawed operation”. The UNRWA is responsible for delivering services to some 5.4 million Palestinians, while this move will affect some 3,000 students who attend seven UNRWA schools in two refugee camps that sit within Jerusalem’s municipal boundaries, according to the agency. 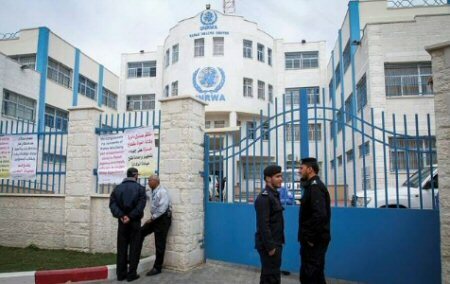 UNRWA spokesman Sami Meshasha, said on Sunday that the agency has not received any official notice from Israeli authorities regarding reports of an Israeli plan to shut down UNRWA-run schools in occupied Jerusalem. The statement came only after Israeli media published reports saying Israeli officials are set to revoke permits. He said the agency had been in contact for some time, with several parties, regarding the renewal of the mandate of the Agency, which typically begins by the end of this year. 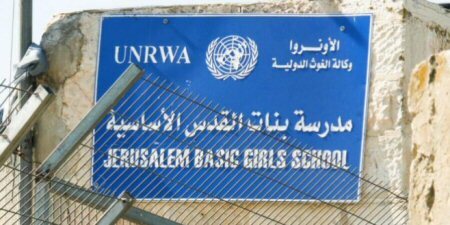 According to UNRWA, the agency runs seven schools in two refugee camps that are located within Jerusalem’s municipal boundaries, which serve about 3,000 students enrolled. “The failure of the international community, particularly the Security Council, to implement the resolutions of the international legitimacy on the Palestinian-Israeli conflict and to hold the occupation authorities accountable for their grave violations of international law, human rights principles and the Geneva Conventions has encouraged the occupation authorities to begin the most dangerous episode of the liquidation of the Palestinian presence in Jerusalem,” the Ministry said in a statement, according to WAFA. Meanwhile, Ma’an further reports, Israel and the US have criticized UNRWA for its count of Palestinian refugees, which included the descendants and not only the original refugees displaced from their homes. The US demanded that UNRWA “figures out the actual number of true Palestinian refugees,” emphasizing that the total is not correct, in order to restore aid funds to the agency. In July, a new bill, entitled “The UNRWA Reform and Refugee Support Act,” was introduced in the US Congress that recognizes only 40,000 Palestinian refugees instead of 5.3 million refugees. The newly introduced bill would ensure that the contributed to the United Nations Relief and Works Agency (UNRWA) would go towards the resettlement of Palestinians displaced by the Arab-Israeli war of 1948, and not their descendants – who are a total number of 5.3 million people. According to Republican Congressman and initiator of the bill, Doug Lamborn, said that the “refugee status is not something that can be handed down from generation to generation,” referring to the descendants of Palestinian refugees who were born and are living in other countries. UN statistics reveal that Palestinians are, in fact, the largest refugee group, anywhere in the world.